← Happy International Day of Runology! Lena Peterson at the Field Runologists meeting in Älvdalen 2013. Photo: Marco Bianchi (CC BY). 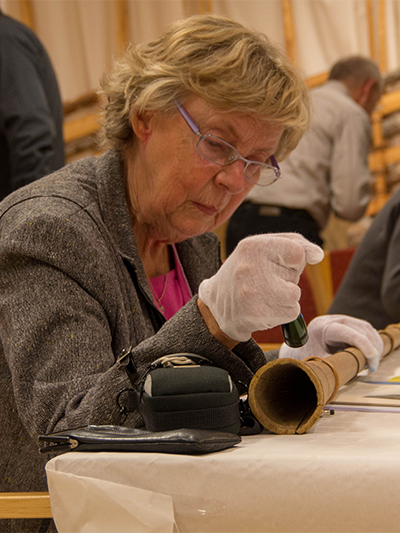 Professor Emeritus Lena Peterson turns 80 today, and Uppsala Runic Forum congratulates her! Her importance to modern runology is huge, and I would like to take this opportunity to inform the readers of her role in the creation of a runic research environment at Uppsala University, especially since this is not as well-known as it should be. Uppsala runology has a long history. This is where Johan(nes) Bure(us) the first “modern” runologist started working in the 1590s. He documented over 600 runestones and other runic objects, although very few were published by himself. The late 17th century medic and botanist Olaus Rudbeck also took an interest in runes when writing his (in)famous Atlantica where he tried to prove that Sweden was the site of Atlantis and the source of all civilization… Two other botanists, Olof Celsius and the illustrious Carl Linnaeus, also made important contributions to runology in the 18th century, as did the linguist and political scientist Johan Ihre. In the 19th century we have Carl Säve, the first holder of the chair in Scandinavian Languages at Uppsala University (the tenth of which is writing this). In the first half of the 20th century the primary runologist was the professor of Swedish, Otto von Friesen, but after his death in 1942 runic interest languished in Uppsala. It took almost 40 years before the revival that led to Uppsala again becoming the runic hotspot it is today. The person who initiated that process was Lena Peterson. In her 1981 dissertation on women’s names in Old Swedish, she discussed also the runic material in depth. She has made important contributions in many scholarly articles since. Her crowning effort are the authoritative Word index to the Swedish runic inscriptions (3rd edition 2006) and Dictionary of proper names in Scandinavian Viking Age runic inscriptions (5th edition 2007). Lena Peterson was also an outstanding doctoral supervisor to myself and Svante Lagman (both 1990), as well as to Marit Åhlén (1997), Per Stille (1999), Thorgunn Snædal and Patrik Larsson (both 2002). Her personal interest and emotional support, solid scholarly foundation, and uncompromising quality standards have been absolutely vital in building that runological environment that we enjoy now. I cannot praise her efforts enough or rate her prominence high enough. Her importance to me personally could only be expressed in words too emotional in an academic context. I take this opportunity to make two further announcements of interest to the runic community, the first positive, the second sorrowful. In early February I will be making my eighth runic visit to the United States since 2010. This time I will appear at the Nordic Spirit Symposium in Thousand Oaks, CA. Then it’s off to Seattle to present to an invitation-only event and to give a public lecture at the Nordic Museum. I am happy to be joined by three board members of the American Association for Runic Studies: Loraine Jensen, Myrna Smith and Mary Hegge. 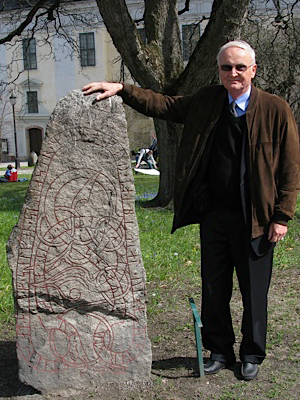 Nils Hasselmo and runestone U 1011 from Örby in Uppland, now placed in the University park in Uppsala. On a more somber note, I am sad to announce that Professor Nils Hasselmo passed away last Wednesday, January 23, at age 87. He was born in Värmland and was educated at Uppsala University before emigrating to America in the late 1950s. Nils got a doctoral degree at Harvard in 1961 and an equivalent (licentiatexamen) in Uppsala the following year. He was professor at the University of Minnesota 1965–83, provost at University of Arizona 1983–88 and returned to Minneapolis as a very much-appreciated president of the U. of M. 1988–97. After “retirement” Nils served as president for the American Association of Universities, a most prestigious appointment. He served on the board of the American Friends of Uppsala University from its start to his death. A fuller obituary may be read here. Nils Hasselmo wrote his BA thesis on verbs of Runic Swedish, but that is not what gets him a mention on this blog. Apart from being one of the kindest, friendliest and wisest men I have met, he was also the first sizable donor to the Runic Chair in Uppsala with a $10,000 personal gift back in 2014, a commitment he followed up with another generous contribution very recently. He kept all of his faculties to the very end. He attended the Rune Rede at Harvard in 2014, took an interest in the Kensington stone, and voiced his concerns about the “fringe elements” and the threat to higher education at the famous Six-President Event in 2015. He appears in all four editions of the campaign brochures with an endorsement of the Runic Chair. In 2016, Loraine Jensen and I visited him in his and his wife Ann’s gorgeous home in Tucson, Arizona. He offered us sage advice and took a keen interest in Arizona runestones (all modern). Having the support of such a man meant a lot. This entry was posted in Runic Research and tagged Carl Linnaeus, Johan Ihre, Johannes Bureus, Lena Peterson, Nils Hasselmo, Olaus Rudbeck, Olof Celsius, Otto von Friesen, Research history, Runic research. Bookmark the permalink.